We know that sunglasses protect the eyes from harmful UV radiation that can lead to diseases like cataracts, macular degeneration (which is a leading cause of blindness in North America) and eye cancer. But a recent survey by the Vision Council found that only 1 in 6 adults said eye health was the reason for wearing sunglasses (in fact health is the major reason to wear sunglasses). Two-thirds of respondents said that the purpose was to prevent glare. • Nearly half simply forget. • About 14% lose or break sunglasses often. • About 20% don't believe their eyes are at risk from sun exposure. That brings us to the See for Life Sunglasses buying tips. These tips will help ensure that you wear your sunglasses often, that you don't loose them and that, as a result, your eyes remain healthy for life. Buy sunglasses that you love. That way you are more likely to wear them and less likely to lose them. If that means splurging on a pair of $350 Gucci sunglasses, consider it an investment in your eye health. There. Now you have an excuse to treat yourself. Consider multiple pairs. All your sunglasses do not need to be expensive and it is useful to have multiple pairs to keep in the car, at work etc. That way, if you do forget your sunglasses, you have backups. A great way to get multiple pairs is to update your sunglasses every year or two. The older pairs become your backups. Get new UV protection technology. For the best UV protection, have your eye doctor give you lenses that protect you from UV radiation that reflects off of the back side of the lens (such as Crizal Forte UV). This is very new technology and 99% of the sunglasses out there do not have it. Traditional UV protection only stops UV radiation that comes at you from the front of the lens. That's only about half of all the UV radiation that can get into your eye. 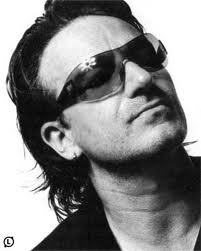 Bono wears them. Sunglasses are fun and cool. Sometimes its nice to just do something for the sheer fun and pleasure of it. Check the ESPF. Have your optometrist fit your sunglasses with ESPF 50 Sun lenses which provide the most advanced UV protection available today. What is the best sunglasses lens in the world? Find out by asking about the ESPF rating.